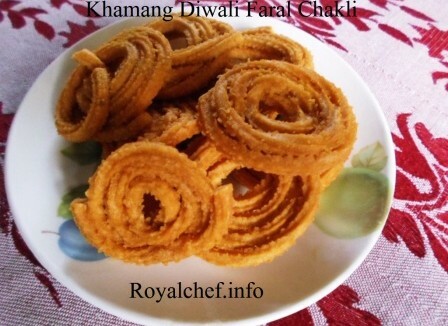 This is a Recipe for making at home sweet and delicious Mithai Shop Style Zatpat or Instant Jalebi. The recipe is not as complicated or difficult as it seems, you can quickly make tasty Jalebis by following this step-by-step recipe. Take the Refined Flour, Cornflour, Salt, Curd and warm Water and mix it well and keep it aside for 15 minutes. In a Vessel mix the Sugar, Water and keep it on slow flame for 10 minutes for preparing the Sugar Syrup. Remove from the flame and add the Orange Syrup or Lemon Juice and mix it well and keep it covered so that it remains hot. Heat the Ghee in a non stick Kadai. Dissolve the Soda-bi-Carb in a teaspoon of Water and add it to the Jalebi mixture and mix it well. 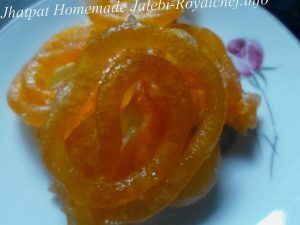 Take a medium sized thick plastic bag (milk plastic bag will do) and cut the plastic bag in one corner to make a small hole and pour some Jalebi mixture into the plastic bag, then directly prepare the Jalebi into the Ghee and deep fry them until the color changes into golden yellow color. Then remove the Jalebi from Kadai and soak it in the Sugar Syrup for 2-3 minutes.